Village of Oak Creek Real Estate & Golf Resorts and Some History! When it comes to Village of Oak Creek real estate & Golf Resort homes for sale, you only need to go to the Village of Oak Creek (VOC) to fulfill your dream. Homes are sprinkled around the 45 holes on two golf resorts and one executive golf course. For those who enjoy this sport, there is a home for you either close to or on a golf course. But for those who like the serene atmosphere and beauty of a home straddling one of the beautiful and well manicured fairways this may be right for you as well. A little history…Sedona legend Helen Varner Vanderbilt Frye (1908-1979) who was married to TWA President Jack Frye built the House of Apache Fire now part of Red Rock State Park and another notable estate in VOC called “Sky ﬁres” in what is now called Sedona Golf Resort. The house was destroyed in 1983 ﬁre. Big Park is a census-designated place in Yavapai County, Arizona. It was founded in the early 1800‘s and today is otherwise known as Village of Oak Creek or VOC. When it was formed, there were nothing but farms and ranches scattered about the area. But the area has slowly transformed over the last 50 years into a sleepy bedroom community of Sedona with golf resorts. People who may ﬁnd the 89A corridor of Sedona a little too busy for their tastes usually ﬁnd they feel right at home in the Village of Oak Creek. VOC still retains that small town charm nestled in some of the most scenic and familiar red rock views that area has to offer. Bell Rock and Courthouse Butte stand out as you travel on Hwy 179. The estimated population from the 2010 census is 6,147 (www. quickfacts.census.gov). That is a 2.6% increase from 2000. The land area is 5.26 miles. Most residents ﬁnd housing prices very friendly and inviting. 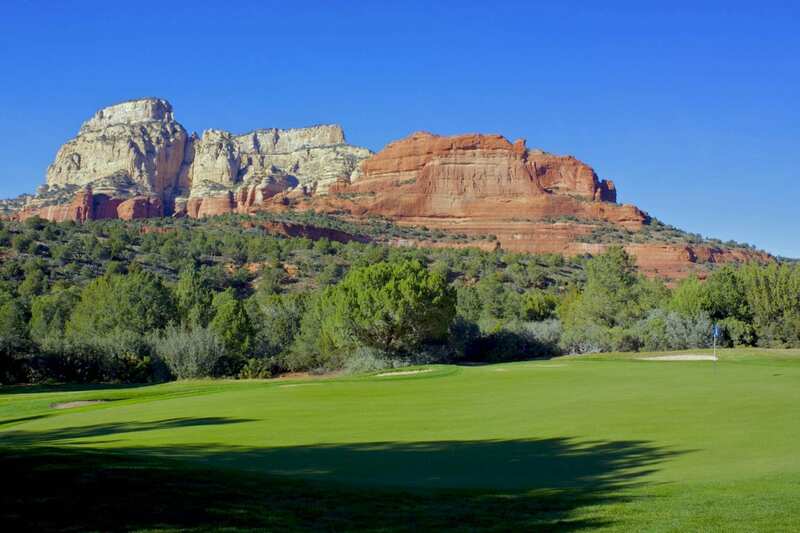 If you like golf, the area boasts three golf courses; Oak Creek Country Club, Canyon Mesa, and Sedona Golf Resort. The “Village” as it is often called, has a grocery store, a bank, a hardware and furniture store, a shopping area as well as a resort hotel. You can ﬁnd just about every type of business you may need. Situated on Hwy 179, it is close to Sedona proper and also has easy access to Interstate 17. VOCA – Village of Oak Creek Assoc. National and County-wide news sources are slow and do not accurately represent what is happening in the Village of Oak Creek area. My Statistics are updated weekly to keep you up to date. TO SUBSCRIBE TO THIS MARKET REPORT... Select the SAMPLE REPORT and scroll down to the end of the first paragraph. The last line states "Click here to stay informed with the Sedona market. This will bring up a subscribe page, or you can call Sheri Sperry at (928) 274-7355 to sign up for a Market Report for Village of Oak Creek, AZ 86351. Also there is a subscribe button at the top of each report.